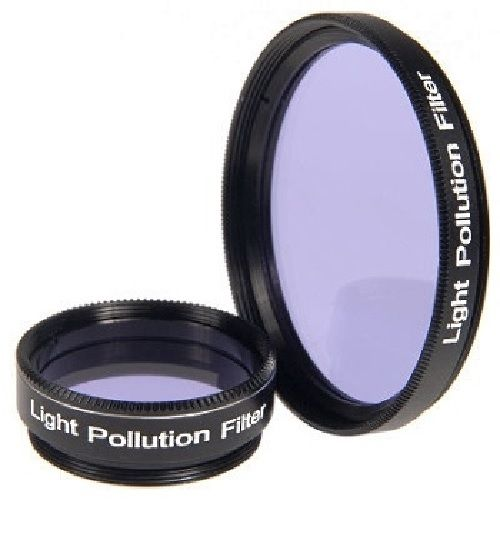 The Light Pollution Filter is a contrast-enhancing anodized aluminium, optical glass filter designed to block out the wavelengths of light emitted by mercury-vapour light and other common causes of light pollution, whilst providing higher transmission at critical hydrogen-alpha and hydrogen-beta lines than competing filters. Bright, light-polluted skies appear much darker, and the contrast between object and sky is improved significantly. This contrast-enhancement effect is particularly apparent on nebulae. Unlike stars, emission nebulae give off light in a very narrow range of wavelengths. These filters allow maximum transmission of the important wavelengths of H-alpha, H-beta and doubly ionized oxygen – the ones most commonly emitted by nebulae. Views of galaxies and star clusters are also enhanced, but to a lesser degree. Also improves contrast on reddish planetary detail. Works well in telescopes of all apertures but is highly recommended for use on smaller telescopes up to 114mm diameter, where conventional filters swallow up too much light. Supplied with storage case.